A Southern Grace: challenge accepted! When people started raving about the pumpkin cream cheese muffin at Starbucks, I took it upon myself to recreate it at home, and I think I did a really good job. Granted, I had to give Starbucks even more money than I normally do in a week's time in order to obtain a comparison sample, but it was a necessary evil. *Skip the cream cheese filling altogether and just shmear them with it later. *Mix the pepitas right into the batter or omit them completely. *Turn the batter into a loaf or a (cream-cheese-frosted) cake (8x4-inch or 8x8-inch, respectively). One last aspect of these that seals my victory over Starbucks in this war battle is the price-point. My cost was a mere fraction of the $2.65 they charge for one muffin. So there. Neener neener. I win. Chew on that (...and a muffin). Preheat oven to 375 degrees F. Fill 10 muffin cups with paper liners or spray generously with non-stick spray. Mix all dry muffin ingredients together. Add the wet ingredients to the dry mix and stir just until mixed. Spoon mixture into muffin cups, filling each at least 3/4 full--we want a nice dome on these! To make the filling, beat the cream cheese, powdered sugar, and cinnamon with a hand mixer until thoroughly combined and smooth. Push or squirt about 1 tablespoon of cream cheese filling into each muffin such that a little circle of cream cheese still shows on top. Sprinkle pepitas along the edges of each muffin, pressing in slightly. Let cool in muffin tins for 10 minutes, then transfer to cooling rack to complete cooling. Well, you certainly have pushed that cart way past Starbucks with these Pumpkin Cream Cheese Muffins. Exremely tempting! This muffins is irresistible. These sounds yummy! I’ve been so obsessed with apples for fall that I’ve neglected pumpkin! Must make these soon! Funny! I've done the same with a grocery cart a time or two. Your muffins are a winner for sure. A must try, thanks for the recipe! Pumpkin muffins with cream cheese frosting are awesome. Putting the cream cheese inside is even better! Great idea! Delicious looking. Well worth out-walking everyone else! These pumpkincream cheese muffins look so good!! Don't even need to picture in comparison to know that yours beat the Starbucks one! Mmmmm!! I seriously think my coffee would be WAY better if I was eating one of these beauties with it. Yes, I had these from the Starbucks...and love it! Thank you so much for the recipes...I sure will be making them! These muffins look absolutely incredible! Oh my goodness! Gimmie, gimmie, gimmie! I love pumpkin muffins. Livin' where I do, I don't get to Starbucks, but I am glad that you do so that you could have the inspiration for this recipe! Sounds delish! 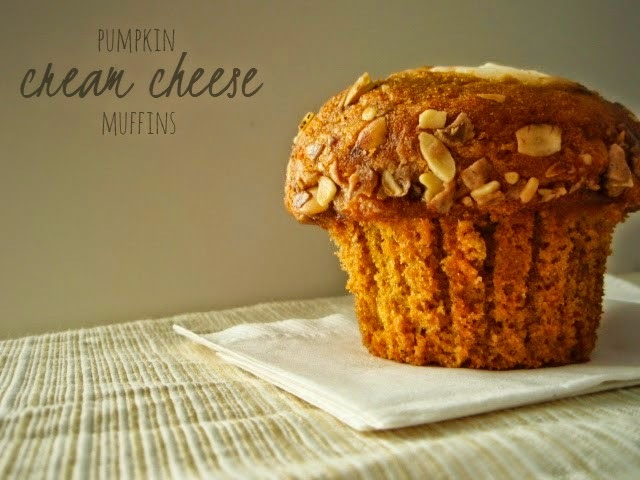 They look incredibly delicious...and I just can't get enough of pumpkin! They look to die for and I bet they tasted better than the store bought! Hi Grace! I made these muffins the other day and they were amazingly good! I loved them so much I rushed to put them up on the blog yesterday! :P Thanks for the fantastic recipe! I'm suuuuper competititive too. I have to the first, best and most efficient while doing it. I know what I'm not good at though...but your muffins look AMAZING. You win. Totally.